WASHINGTON (AP) -- Andy Roddick saved three break points in the third set and ended the match with a break of his own to beat 15th-seeded Radek Stepanek 6-3, 1-6, 7-5 on Thursday night at the Legg Mason Tennis Classic. 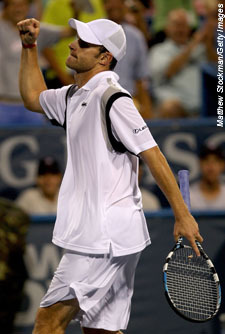 Roddick's patience was tested all night by Stepanek, who had 20 aces and didn't face a break point in the final set until the last point of the match. But Roddick, a two-time champion of this tournament, stayed alive in the match by saving a break point at 2-all in the third set and two more at 4-all. Stepanek, also broken late in the first set, set up Roddick's match point by hitting a forehand long. He ended the match with a backhand into the net. Roddick will face No. 5 Hyung-Taik Lee, who beat Julien Benneteau 2-6, 6-2, 6-3, on Friday. In the first set, Roddick had four break point-chances with Stepanek serving at 3-4, and took the lead when Stepanek's backhand volley sailed long. He closed out the set in the next game with one of his 23 aces. Second-seeded Tommy Haas had considerably less trouble earning his spot in the quarterfinals, beating No. 16 Michael Russell 6-3, 6-4. Haas, playing in his first tournament since Wimbledon, where he withdrew with a torn stomach muscle, jumped out to a 3-0 lead in the first set and a 3-1 advantage in the second. He finished with 10 aces and never faced a break point. Up next for Haas is upstart American John Isner, who beat Wayne Odesnik 6-7 (4), 7-6 (3), 7-6 (2). It was the third straight day Isner, playing in just his second ATP tour event, won a third-set tiebreaker. Gael Monfils advanced to the round of eight for just the third time all year by beating Michael Berrer 6-7 (5), 6-3, 6-3. Monfils is in a stretch of playing nine straight tournaments, a run that started at a clay-court event in Austria the week before the French Open. But before this week, he'd logged a total of 20 matches during that span. Monfils said he expects even better results. "Quarterfinals, for me, it's nothing. I expect to win tournaments," he said. The "quarterfinals is not my goal." Monfils had a chance to win the first set on Berrer's serve, and had an opportunity to serve for the set before losing in the tiebreaker. However, he responded with a break in the second set and two in the third, including one to end the match. Monfils will play the winner of a match between third-seeded Marat Safin and Robert Haase scheduled for later Thursday. Seventh-seeded Ivo Karlovic, who has been overpowering this week, had 19 aces and got in 82 percent of his first serves in a 6-2, 6-4, win over Vince Spadea. Karlovic, who served 37 aces in his two matches, will play Paul Capdeville. He advanced by beating 2002 Australian Open champion Thomas Johansson 7-6 (5), 6-3.